I'm home alone a lot this week because Alex has been working nights, until late. I cooked myself fancy dinner. 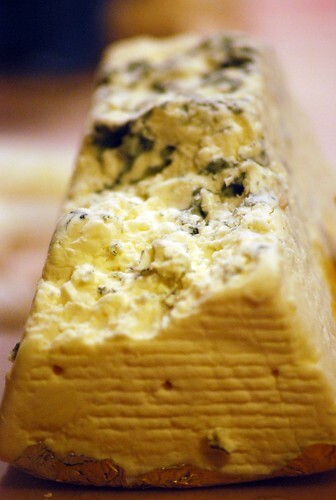 Blue cheese. There's been a lot of talk about whether blue cheese is gluten free or not. I've been reading more and more articles about how blue cheese is gluten free, but if you're not sure go with one of the brands who state that their cheese is gluten free, like Boar's Head or Rosenborg. 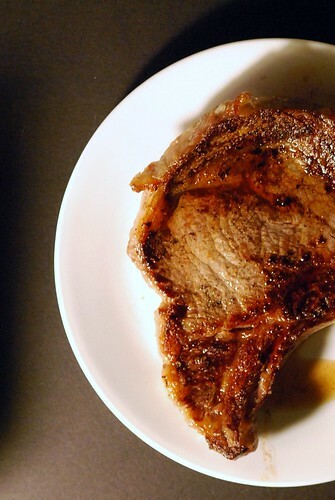 Heat half the butter over high heat, add a drizzle of olive oil, and salt and pepper both sides of your steak. Sear the steak on one side until nice and crispy and brown, then flip and sear on the other side. Don't cook too long, you don't want to overcook your steak! Remove from the pan and let rest on your plate. Melt the rest of the butter in the pan you cooked the steak in. 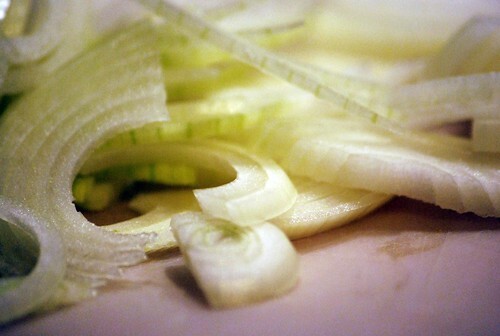 Slowly cook the onions and garlic, until softened and starting to caramelize. Push the onions to the side and dump in the mushrooms. Cook until starting to brown, then pour in the cream. Cook until it starts to bubble, then stir in the blue cheese. Pour over the steak, and eat! This entry actually made me salivate!! Thanks for the info about Boar's Head blue cheese being gluten-free. I haven't had blue cheese since going gluten-free and haven't bothered with looking for one yet. This recipe inspires me to get some - because YUM! Your dishes always look so delicious! I like that blue cheese sauce; it could go with so many things. I have to get me a spiral slicer. I’ll try to do better on recipes. Often, I don’t remember how exactly I did a sauce because I am really hooked on winging it. 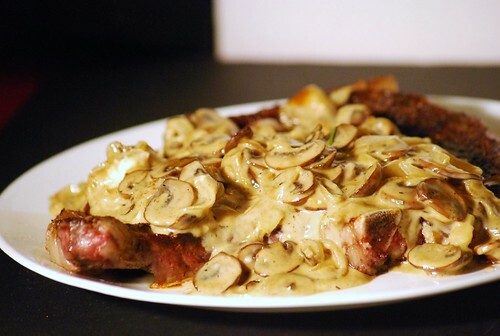 The blue cheese sauce looks wonderful! Hello. I was just trying to find some of your other recipes and your links aren't working to search for them.....I am dying to make your lemon cake again. This looks amazing! Also, I made the pecan biscotti you listed. I didn't have pecans so used 1 cup craisins and 1/2 c chocolate chips. They turned out amazing! My kids, who are VERY picky and NOT gluten free, downed half the pan in one sitting! Thank you for that recipe! It's a keeper for sure! That’s a gorgeous mushroom recipe! 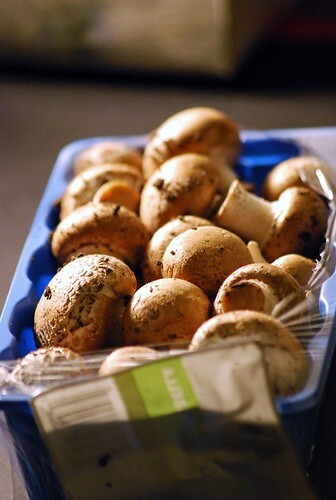 Consider submitting it to out Battle Mushroom and win some wild, gourmet mushrooms! SCORE!!!!! i FINALLY found a blog i like the food on!!!!!!!!!!! LOVE THIS PLACE.... MAKING THIS bleu cheese and steak tonight!!!!!!!!!!!!!!!!!!!!!!! I bet this tastes heavenly divine! I made this for dinner, and it really hit the spot. We'll make this again soon, especially when Pat take care of the steaks on the grill. I made this tonight and my husband said it was better than any steak topping he's had ANYWHERE... I will be making this again and again! This is so good, and so simple! Great recipe. My steaks were medium rare and I just added shrimps to my blue cheese sauce. Wow oh wow. It was dimensional. What kind of "cream" do you use?